Sales' afternoon children's program featured characters like White Fang and Black Tooth (big dogs whose paws, coming into the frame from off-camera, were all one could see of them, and they communicated via grunts that Sales then repeated in English), people who'd knock at the door (an arm often their only visible attribute), Pookie the Lion, Onions Oregano, and Philo Kvetch (a detective). Lots of gags and puns; the punch lines were often punctuated by a pie in the face for Sales. During the mid-'60s, the program aired on WNEW-TV (5) in New York City, but was seen nationwide via syndication. I loved to watch this show. 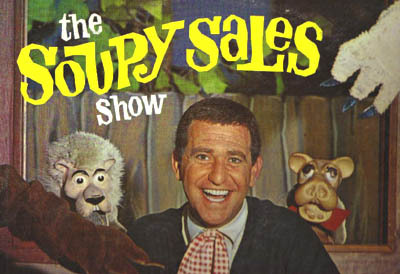 We kids used to imitate Soupy doing his puppet conversations. I've also seen some of the funny outtakes which were a bit raunchy at times but mostly funny. I could dance a "mean" Soupy-Schuffle" when I was a kid ! 1962 to April 13, 1962. The Soupy Show was, without a doubt, one of the funniest shows ever! I am 61 and I still laugh when I see clips of it! 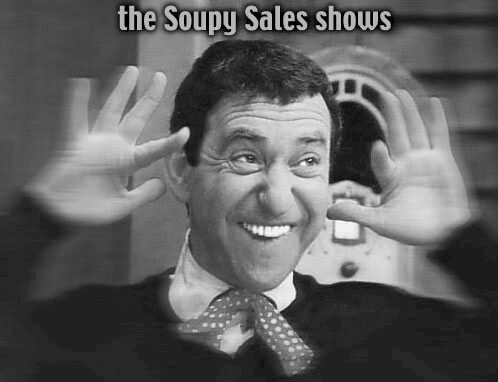 Soupy was a brilliant comedian. No one else could have pulled off some of the things he did! I was in the studio audience for one show in, maybe, 1965.